I caught up with Phil Lansing of Carpe Carpum—you’ll read about him in our August issue—to learn more about his Idaho-produced organic fish fertilizer made from invasive European carp in nearby freshwater rivers and lakes. Q: How’d you get involved with this project? I spend my summers as a fisherman in Alaska, so I know a thing or two about catching fish. Back home in Boise, I consulted with Idaho Department of Fish and Game to figure out what to do about these invasive carp in Idaho and surrounding states. I realized that catching fish isn’t the problem; getting paid to catch them is the problem. So we had to create a market. What kinds of damage do the carp cause?They uproot plants as they eat them, killing the vegetation and stirring up so much mud that photosynthesis can’t occur and no new plants can grow. Also, a clear lake reflects light, while a muddy one absorbs it—choking oxygen and raising temps. 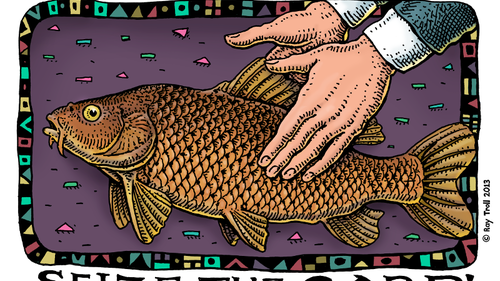 Those conditions are great for carp—they love it—but native fish species die. Additionally, migratory birds lose their habitat. 1ook baby ducks used to fledge at Malheur National Wildlife Refuge in Oregon; now that number is down to 10k because of habitat loss. So the carp become fertilizer?Yes, an organic fertilizer made from a cold-hydrolysis process. It’s different from an emulsion in that it smells better and retains more nutrients—emulsions are made in a hot process that destroys some of the microbial action. Carpe Carpum is selling like hotcakes! My farmer friends in the slow food movement just love it—they’re seeing more beneficial fungi growing in the roots near the plants, and their crops need less water because the soil is so rich. How big of a difference has the product made? We are still in the, ahem, artisanal production stage and a long way from a real impact. We’ll need to remove 4 or 5 million pounds a year from Malheur to make a difference, for example. But the market is there for the fertilizer and we are deeply committed. Its just a matter of sticking with it and gradually ramping the business up. We can’t eradicate the carp but controlling them will make a huge difference for water quality and wildlife. Plant life and everything else really bounces back once the carp are reduced. How many fishy per bottle? We use small carp right up through 30-pound lunkers—there are about eight pounds to a gallon of Carpe Carpum.Get a bottle of your own! We’re using some in the test garden, and we’d love to know how it works for you! Also, remember that time Senior Food Editor Elaine Johnson made her own fish fertilizer?